It’s entirely possible that the victim, who has name suppression after pleading guilty to drink-driving, and was being held in the cell while his bail conditions were typed up, was conveniently forgotten and was being extrajudicially punished by police. Truth hurts New Zealand’s $10-billion tourism industry. The average tourist would not visit this country, if they knew true extent of the daily carnage on our deadly roads. Truth about the mayhem would also hurt the massive foreign investment in New Zealand. To protect the foreign investment, NZ TOURISTS or truth? 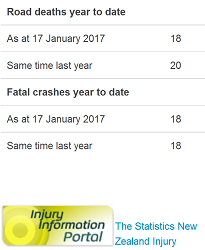 Campaign (censorship of road fatalities) continues unabated… See blog content for some of the most blatant omissions and statistical resurrections by Ministry of Transport. This entry was posted on January 17, 2017 at 8:53 pm	and is filed under Tourist Deathtrap. Tagged: justice, Kafkaesque, kiwi courts, Masterton District Court, news censorship, road toll, tourists or truth. You can follow any responses to this entry through the RSS 2.0 feed. You can leave a response, or trackback from your own site.